Akshaye Khanna as Dev, a police officer, is investigating a double murder case that has only two witnesses, who are also the prime suspects. The suspects - Siddharth Malhotra as Vikram , an acclaimed writer, and Sonakshi Sinha as Maya, a young homemaker, have different narratives about the events of that fateful night. Both the stories seem true but there can be only one truth. Dev is torn between the two versions of the story, and will not settle till he finds out what happened that night. 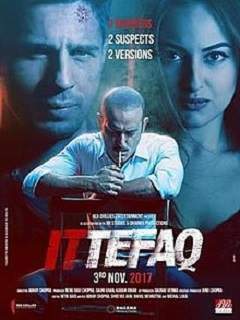 Ittefaq earned ₹ 0.02 Cr on its 42nd Day, Now Total Collection ₹ 30.21 Cr ! Ittefaq earned ₹ 0.12 Cr on its 35th Day, Now Total Collection ₹ 30.19 Cr ! Ittefaq earned ₹ 0.32 Cr on its 28th Day, Now Total Collection ₹ 30.07 Cr ! Ittefaq earned ₹ 1 Cr on its 21st Day, Now Total Collection ₹ 29.75 Cr ! Ittefaq earned ₹ 1.35 Cr on its 14th Day, Now Total Collection ₹ 28.75 Cr !